On this day in 1967 NASA, the American people and the world were shocked when a benign ground test went wrong. After several delays and hours in the capsule, Command Pilot Virgil I. 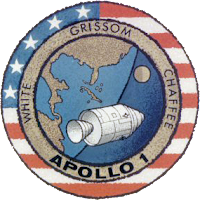 "Gus" Grissom, Senior Pilot Ed White and Pilot Roger B. Chaffee perished when a combination of failures in design and implementation conspired to a horrific fire. Oxygen atmosphere, a hatch that opens towards the inside, flammable materials, a wrench and electric arcs were considered to be culprits in the incident. A lot of changes were made after the incident - Oxygen-Nitrogen atmosphere in the capsule, removal of flammable materials (including embroidered patches), outward opening hatch, stricter quality control to name a few. I don't want to reiterate everything written in an abundance of web sites about this. I just wanted to pay respect to these space pioneers that paved the road to what came after with their lives. It is important to remember them and the others that payed the dearest price for space exploration, especially in a time when there is a question mark hovering above NASA and the American involvement in space.